Offer proximity features under your brand. 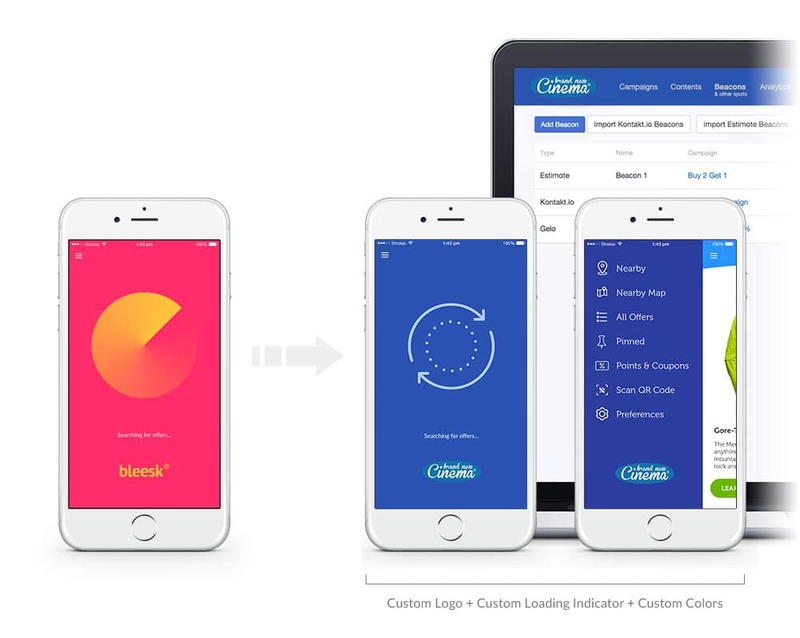 Customise entire look & feel and choose features that work for you. Create and oversee customer accounts. Are you a marketing agency or a company that has customers who are looking for proximity services? We completely rebrand the App, CMS & SDK so you can offer them under your brand. Customise name, copy, the entire look & feel or even language. Create sub-accounts so customers can manage campaigns on their own. Send your branding guidelines to match the look & feel of your company and the domain you want the CMS to be at. Create accounts for your customers to log into their dashboard. Send app logo to match the look & feel of your brand. Change icons, animations, user preference images or even texts in the app. Choose features that you want your customers to have like Prime Offers, Retargeting, Digital Signage etc. We designate a person to guide you during the rebranding process and answer all questions that come up. We provide you a detailed list of assets required to proceed with the development. If you decide for more custom approach our design team will send you UI source files. After your platform is ready, you have 14 days to test it thoroughly and provide us your feedback or requests for change. Deliver proximity campaigns with beacons. Our platform is compatible with all iBeacon & Eddystone devices. Deliver proximity campaigns using WiFi routers. Send notification with proximity campaign to people that entered a defined geographic area. Reward loyal customers with coupons for making a purchase or visiting a venue. Collect data on customer satisfaction. Engage customers by sending Push Notification to their phone regardless of their location. Create QR code campaigns with special offers. For people who do not have an app, create QR code campaign with any URL address. NFC enables brands, advertisers and retailers to deliver proximity campaigns without an app on customer's phone. Create, deliver and analyse Physical Web campaigns. Help customers see where offers are located on a map. Navigate them to a venue or show them their location indoors. Re-engage customers that walk away with personalised campaigns. Facebook Pixel and Google Ads compatible. Engage customers with personalised and contextual campaigns on any TV display based on customer behavior. Increase conversion by sending campaigns to selected customers. Collect their name, e-mail, age, gender and preference. Proximity campaigns through beacons, geofencing and QR codes are getting more popular every year. Now you can benefit from this trend by selling proximity services to your customers. Are you a marketing agency that wants to become a market leader? Proximity platform is a must-have tool for your customers. Every agency customer is satisfied when his venue attracts more people and thus increases its profits. Proximity campaigns enable all that. Offer proximity services to your customers through a self-service CMS. No need for you to spend hours creating campaigns, unless you want to. Our platform does not require coding skills. We provide guidelines and knowledge center to help you get started. You can offer your own proximity SDK for customers who have their mobile apps ready or want to build one. How can I pay for White Label? We use Paypal and we do accept wire transfers as well. Do I get regular updates to the App & CMS? Bleesk App & CMS are updated on a daily basis, you decide when it is the right time to update your platform to the latest version. Can I change a domain for my CMS? Yes, you can change a domain name, CMS name, logo and branding. Can I manage sub-accounts for my clients in the CMS? Yes, as an owner & admin you can create, manage and oversee accounts for your clients. Yes, you can cancel anytime, no questions are asked but we would highly appreciate if you will give us some feedback. Can I offer different priviliges to different types of clients? Yes, you can create manager or regular type accounts so that users have different priviliges depending on their role in your business. Our pricing is based on the number of features you choose to use. We charge on a monthly basis and you can turn on/off features along the way. Can I get my App & CMS translated to a different language? Yes, you can customise all texts in the App & CMS. Yes, we offer 50% discount for customers who want to sign up for yearly plan. What features are included in Demo? Demo consists of a fully functional mobile App and CMS with all features included. Push & Prime Campaigns work with White Label only and therefore are not included in Demo.